The hot rolling technology is the most widely used method of shaping metals and is particularly important in the manufacture of steel for use in construction and other industries. In metalworking, rolling is a metal forming process in which metal stock is passed through a pair of rolls. Rolling is classified according to the temperature of the metal rolled. If the temperature of the metal is above its re crystallization temperature, then the process is termed as hot rolling. The hot mills using plain rolls were already being employed by the end of the seventeenth century. But the industrial revolution in the nineteenth century saw a new horizon in steel making process, with the considerably expanded markets for rods, rails and structural section, provided further impetus to the development of hot rolling. The basic use of hot rolling mills is to shape up the larger pieces of billets and slabs into narrow and desired forms. These metal pieces are heated over their re crystallization temperature and are then moved between the rollers so as to form thinner cross sections. Hot rolling mill thus helps in reducing the size of a metal thereby molding it into the desired form and shape. Rolling mills perform the function to reform the metal pieces such as billet and ingot whilst maintaining its well equipped micro structure into bar, wire, sheet, strip, and plate. Hot rolled products are frequently categorized into plain carbon, alloy, high strength alloy, dual phase, electrical and stainless steels. This book provides a descriptive illustration of pre treatment of hot metal, the basic principles of heat treatment, types of hot rolled products, principles of measurement of rolling parameters, steel making refractories, performance characteristics of transducers, causes of gauge variation , main factors affecting gauge performance, gauge control sensors and actuators, automatic gauge control systems, strip tension control system in cold mills, flat rolling practice cold rolling, pack rolling, steelmaking refractories, refining of stainless steels, special considerations in refining stainless steels etc. This book is a unique compilation and it draws together in a single source technical principles of steel making by hot rolling process up to the finished product. This handbook will be very helpful to its readers who are just beginners in this field and will also find useful for upcoming entrepreneurs, engineers, personnel responsible for the operation of hot rolling mills, existing industries, technologist, technical institution etc. In the early stages of hot rolling, the ingots or continuously cast strands are converted into a variety of semi-finished and finished products. The former are differentiated on the basis of geometrical shape, such as slabs, blooms and billets, and the latter on the basis of the products shipped, such as plates, hot-rolled strip and rods. Until recently, two or more hot mills may have been necessary to impart the final dimensions to the workpiece. For example, ingots would be rolled first on a slabbing mill and the slabs would be later reheated and rolled to plates on another mill. However, with the advent of the continuous casting of steel, this situation is changing and semi-finished products that were once rolled, such as slabs and billets, may now be continuously cast and sized by in-line rolling stands. As the name implies, plain-carbon steels, representing the most important group of engineering materials known, consist essentially of iron alloyed with carbon. For carbon contents less than 0.8 percent, they are known as hypoeutectoid steels, for contents very close to 0.8 percent as eutectoid steels and for higher contents as hypereutectoid steels. Hypoeutectoid steels are further classified as low-carbon (carbon contents less than 0.2 percent), medium-carbon (0.2 to 0.5 percent carbon) and high-carbon (0.5 to 0.8 percent carbon). Plain-carbon steels always contain low concentrations of manganese, silicon, phosphorus and sulphur, as well as minor amounts of other elements. As defined by the American Iron and Steel Institute (AISI), plain-carbon steels may contain up to 1.65 percent manganese, 0.60 percent silicon, and 0.60 percent copper in addition to much smaller amounts of other elements. Composition ranges for these steels have been established by the Society of Automotive Engineers (SAE) and the AISI. As an example, a 1020 steel will contain 0.18 to 0.23 percent carbon, 0.3 to 0.6 percent manganese, no more than 0.040 percent phosphorus, and no more than 0.050 percent sulphur for applications to semi-finished products for forging, to hot-rolled and cold-finished bars, to wire rods and to seamless tubing. Free-cutting (rephosphori-zed and resulphurized, and resulphurized) carbon-steel compositions used for these applications may contain significant amounts of phosphorus and sulphur. For example, a 1215 steel should contain no more than 0.09 percent carbon, 0.75 to 1.05 percent manganese, 0.04 to 0.09 percent phosphorus, and 0.26 to 0.35 percent sulphur. Plain-carbon steels may also be classified in accordance with their method of manufacture, such as basic open-hearth, acid open-hearth, basic oxygen, basic electric furnace and Q-BOP steels. At the same time, the method of deoxidation may also be used for categorization, as exemplified by rimmed, capped, semi-killed,or fully-killed steels. Further-more, since the widespread use of continuous-casting machines, a distinction is often made between ingot and continuously cast ("conticast") steels. Generally speaking, plain-carbon steels are hot rolled when their temperature corresponds to the austenitic range. As a consequence, the deformation achieves considerable homogenization which tends to eliminate dendritic segrega-tion by a breakup of the dendritic structure. During the deformation process, recrystallization occurs so that the final austenitic grain size is determined by the temperature of the workpiece during the last rolling pass. Lastly, the dendrites and the inclusions are reoriented in the rolling direction so that ductility in this direction is markedly improved. Although most carbon steels are used without a final heat treatment, such a step may be used to improve the microstructure and properties for specific applications. With respect to rolled products, heat treatments include annealing, normalizing, quenching and tempering, and austempering. To satisfy an increasing demand for carbon steels having hardenability characteristics that are required for a wide variety of heat-treated parts, boron is frequently used as an alloying element in such steels. Very small quantities of boron (as little as 0.0005 percent) increase hardenability markedly although having a negligible effect on the strength of hot-rolled or annealed carbon steels. In addition to carbon, manganese, phosphorus, sulphur, and silicon, some of the other elements present in minute quantities include hydrogen, oxygen, and nitrogen introduced during the steelmaking process, nickel, copper, molybdenum, chromium, and tin present in the steelmaking scrap and aluminum, titanium, vanadium, and zirconium introduced during deoxidation of the steel. Nitrogen plays a role in the aging of the steel and also exerts a strengthening effect on the material. Hydrogen causes embrittlement or low ductility but will gradually diffuse out of small sections even at room temperature. It also causes flaking, manifested by internals cracks or bursts, a condition which may be minimized by slow cooling after forging or rolling (as is now the standard practice in the manufacture of rails). The elements nickel, chromium, molybdenum and copper tend to increase the hardenability of carbon steels and may be important where deep-drawing characteristics are to be obtained after annealing. Tin, in relatively small amounts also adversely affects deep-drawing properties. On the other hand, aluminum acts as a grain refiner and decreases the susceptibility of the steel to strain aging. However, it tends to promote graphitization and is therefore undesirable in steels to be used for high-temperature applications. The remaining two deoxidizers, titanium and zirconium, are usually present in such small concentrations as to exert a negligible effect on the properties of the steels . Alloy steels, which may contain up to approximately 50 percent of alloying elements, are defined as those steels which possess enhanced properties due to the presence of one or more special elements or to the presence of larger concentrations of elements, such as manganese and silicon, than would be ordinarily present in plain-carbon steels. The major classification of steels containing alloying elements are as follows: 1) SAE-AISI alloy, 2) high-strength low-alloy, 3) dual-phase, 4) electrical or silicon, 5) stainless and 6) alloy tool steels. In addition, steels are often categorized as heat-resisting if they are suitable for elevated-temperature service. However, this group of steels really includes those found within some of the other categories. According to the American Iron and Steel Institute (AISI), the definition of an alloy steel is as follows: "By common custom, steel is considered to be an alloy steel when the maximum of the range given for the content of alloying elements exceeds one or more of the following limits: manganese, 1.65 percent; silicon, 0.60 percent; copper, 0.60 percent; or in which a definite range or a definite minimum quantity of any of the following elements is specified or requested within the limits of the recognized field of constructional alloy steels: aluminum, chromium up to 3.99 percent, cobalt, columbium (niobium), molybdenum, nickel, titanium, tungsten, vanadium, zirconium, or any other alloying element added to obtain a desired alloying effect." In this connection, it should be noted that steels containing 4.00 percent or more of chromium should be classified as stainless steels. In addition, the following elements are considered incidental when their concentrations fall below the levels indicated: copper, 0.35 percent; silicon, 0.25 percent; chromium, 0.2 percent, and molybdenum, 0.06 percent. Alloy steels have been standardized and classified jointly by the Society of Automotive Engineers (SAE) and the AISI using a four-digit code. The first digit indicates the type of steel with the second digit signifying the percentage of the predominating alloying element. The last two digits usually indicate the average carbon content in "points" or hundredths of a percent. The functions of the alloying elements in these steels are as follows: the control of microstructure (due to their effect on the hardenability of the steel), the reduction of residual stresses (in the attainment of a martensitic microstructure by the use of a milder quench), the retardation of the process of precipitation and coalescence of the carÂ­bides (hence requiring higher-than-normal tempering temperatures or longer times at temperature to achieve a desired strength level), the strengthening of ferrite structures (where heat treatment is not employed), the improvement of the corrosion resistance of the steel (as in stainless steels) , the augmentation of abrasion resistance (as in alloy tool steels) and the enhancement of the resistivity and the magnetic permeability of the annealed material (as in electrical steels). 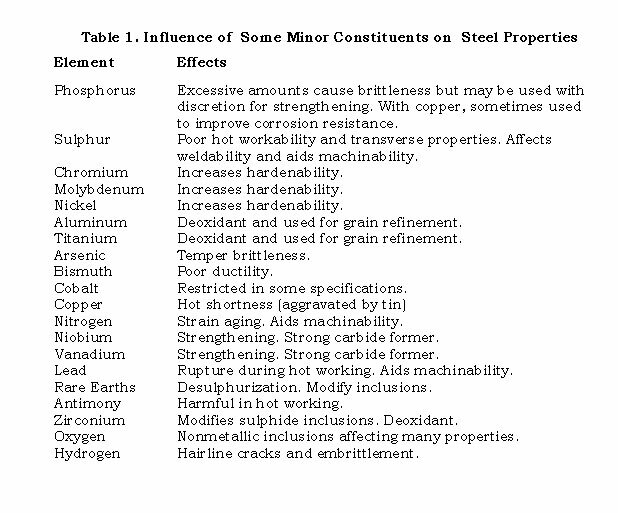 Table -1 summarizes the effects of the various alloying elements. Once referred to as high-tensile steels or low-alloy steels, high-strength low-alloy steels exhibit yield points in excess of 40,000 psi. They contain small amounts of alloying elements and achieve their strength in the hot-rolled or normalized conditions. A listing of the specifications of such steels, as developed by the American Society for Testing and Materials (ASTM) and the Society of Automotive Engineers (SAE) is presented. It is to be noted that the minimum yield strength for these materials ranges from 42,000 to 80,000 psi within certain thickness limitations. These steels are available as sheet, strip, bars and shapes and are generally sold as proprietary products. Usually, they are employed because they are stronger and/or tougher than structural carbon steels and their use generally results in less weight in the structure, such as a bridge or the hull of a ship. However, for prolonged service life, HSLA steels must have adequate corrosion resistance. Accordingly, compositions have been developed for such materials which exhibit four to to eight times the atmospheric corrosion resistance of structural carbon steel. Other properties which must be displayed by HSLA steels include good formability (as measured by bend tests, tensile elongation and fabrication performance), good weldability, good toughness under adverse conditions (particularly low temperatures), good fatigue resistance and good abrasion resistance. Since HSLA steels possess ferrite-pearlite microstructures, their properties are determined basically by the fineness of the structure (mainly the ferrite) and by dispersed phases or dislocations in the ferrite. In addition to microstructural effects, certain alloying elements provide solid-solution strengthening of the ferrite. With respect to the effects of the various alloying elements, they are as follows: Carbon, which significantly enhances pearlite formation, is one of the more effective and economical strengthening elements. Manganese has a similar effect to carbon but to a lesser extent. However, it improves notch toughness and slightly enhances corrosion resistance. Phosphorus increases the strength of HSLA steels by entering into solid solution in the ferrite but, at the same time, it decreases ductility but improves corrosion resistance. Copper increases the strength properÂ­ties of low- and medium-carbon steels to a moderate extent by ferrite strengthening with only a slight decrease in ductility. However, this element is by far the most potent of all the common alloying elements in improving atmospheric corrosion resistance. Vanadium, a widely used alloying element in HSLA steels, strengthens by precipitation hardening of the ferrite and by refining the ferrite grain size. The use of niobium as a strengthening element began in the early 1960's, the element significantly increasing the yield point and, to a lesser extent, the tensile strength of the steel, in a manner similar to that of vanadium. However, the notch toughness is adversely affected unless special rolling practices are used which involve lower-than-normal finishing temperatures or accelerated cooling after hot-rolling. Nitrogen is used in light-gage products to increase strength, particularly in vanadium-containing HSLA steels, due to precipitation hardening. Nickel provides a moderate increase in strength by solution hardening and a slight increase in notch toughness. However, its use results in increased atmospheric corrosion and, in combination with copper and/or phosphorus, increases sea-water corrosion. Silicon provides only a slight increase in strength due to ferrite hardening and chromium provides both strengthening and improved atmospheric corrosion resistance. Titanium exhibits effects similar to those contributed by vanadium and niobium but, because of its strong deoxidizing characteristics, is used only in fully killed steels. Lastly, zirconium is added to killed HSLA steels to modify the inclusions and improve trans verse bend properties. Dual-phase low-alloy steels are low-carbon steels that have been micro-alloyed yith small amounts of elements such as vanadium, niobium or titanium, and are characterized by a microstructure exhibiting islands of a hard martensitic phase in a matrix of softer ferrite. Technically, this structure consists of ferrite and from 5 to 50 percent martensite or lower bainite (usually around 20 percent). As an example of composition, one heat-treatable grade contains 0.1. percent carbon, 1.45 percent manganese, 0.5 percent silicon, and 0.12 percent molybdenum. When initially deformed, such steels behave very much like a low-strength steel in the range of 50,000 to 65,000 psi yield strength but, because of workhardening in succeeding forming operations, the final part will possess the high yield strength typical of 80,000 to 110,000 psi steels. This is due to the fact that deformation increases the yield strength at a rate of about 900 psi for each 0.1 percent of strain. The structure of a DPLA steel can be developed by either of two ways: by heat treatment after rolling or directly through conventional hot-rolling processes. In the former case, the steel is heated to a critical temperature within the alpha-gamma region of the phase diagram for a specific time and then quenched. Ideally, for economic reasons, this thermal treatment should coincide with standard mill annealing cycles but, at the present time, the mill must be slowed down or the steel chemistry must be adjusted to accelerate the dual-phase transformation. On the other hand, when the properties are to be developed in the course of hot rolling, the hot-rolled strip is coiled in the transformation gap as illustrated in Figure-1. Fig. l. Time-temperature path used in production of dual-phase low-al1oy steel. Hansen-and Bramfitt have found that, with respect to a Generation I hot strip mill: 1) the mechanical properties achieved off the mill are comparable with those of as-annealed dual-phase steels although the hot-rolled product differs structurally in being an aggregate of ferrite, martensite and granular bainite, 2) the optimum composi-tion contained 1.0 to 1.2 percent manganese, 1.0 to 1.2 percent silicon, 0.25 to 0.35 percent chromium and 0.25 to 0.35 percent molybdenum with the carbon content being set on the basis of the desired mechanical properties, 3) coiling temperature was the processing parameter that must be carefully controlled and it should be kept below 610Âº C, preferably in the 510Â°C to 610Â°C range, and 4) the microstructure and mechanichal properties of the dual-phase steels are very sensitive to carbon content. Increasing the carbon content produces increased amounts of martensite and granular bainite, the result being significantly higher tensile strengths and reduced ductility. The fatigue strength of certain grades of DPLA steels is often higher than carbon steel and weldability is stated to be as good as AISI 1006 aluminum-killed carbon steel. Low-temperature toughness and ductile-to-brittle transition temperatures are comparable with those of low-carbon steels. These steels are iron-silicon alloys with an upper limit of about 5 per cent silicon. They may be categorized as oriented and nonoriented grades, the former containing about 3Â¼ percent silicon and providing the least core loss. The nonoriented grades may be further classified into 1) low-silicon steels containing from about Â½ to 1Â½ percent silicon, 2) intermediate-silicon steels with about 2Â½ to 3Â½ percent silicon, and 3) high-silicon steels featuring about 3-3/4 to 5 percent silicon. There are a number of grades of electrical sheets in each of the above categories. Specifically, there are three principal oriented grades identified as AISI Type Numbers M-6, M-5 and M-4. Other oriented grades less frequently used include the M-3, M-7, M-8 and M-9 types. Core losses of some of these materials are as presented. There are eight nonoriented grades, AISI Type Numbers M-47, M-45, M-43, M-36 (low-silicon), M-27, M-22 and M-19 (intermediate-silicon) and M-15 (high-silicon). The steelmaking operations for the oriented grades are closely controlled to ensure the cleanest and purest steel possible. The alloying addition of ferrosilicon is made in the ladle and the pouring practices are much like those used for other fully killed steels with the ingots being hot-rolled to slabs by ordinary practices. The hot-rolled strip is further processed by hot rolling in the case of the high-silicon steels or by cold rolling in the case of the other grades. With respect to the former, the pack-rolled sheets are usu ally pickled, flattened by rolling and annealed. For the cold-reduction method, the hot-rolled strip is pickled, cold-rolled and subsequently processed by annealing (box and/or continuous annealing) and temper rolling. However, the processing of the oriented product usually involves two stages of cold reduction with intervening continuous anneals and a final heat treatment (box annealing) in a dry hydrogen atmosphere at about 1200Â°C. The three classes of stainless steels, namely martensitic, ferritic and austenitic, have been smelted in either electric-arc or high-frequency induction furnaces until recently. However, the basic oxygen steelmaking process in conjunction with vacuum refining may also be used to make these steels, most of which are cast into ingots and hot-worked as slabs, blooms and billets for the subsequent manufacture of finished products by combinations of hot- and cold-working. The semi-finished forms may also be produced by continuous casting and bottom pressure-casting methods. In the hot working of stainless steels, it is to be noted that, at temperatures less than 1500ÂºF, the steels exhibit thermal conductivities lower than those of carbon and alloy steels. Accordingly, unless care is exercised when heating these materials, surface burning will result. Moreover, the temperature ranges for optimum hot-working characteristics are narrower than those for carbon steels and hence closer temperature control is necessary during hot working. Optimum workability for all grades of stainless steel is obtained when the steel consists essentially of a single phase. For austenitic and martensitic steels, small amounts of ferrite can be tolerated in the microstructure as can small amounts of austenite in the ferritic steels. However, the microstructure must be kept under careful control either by adjustment of the chemical composition of the steels or by control of the hot-working temperature. Martensitic steels may be forged, pierced and rolled but, because of their air-hardening characteristics, they must be cooled slowly after rolling before any subsequent operation, such as conditioning and cold working, is carried out. Moreover, the hot-rolled product must be handled carefully because of its brittleness. Ferritic steels can also be forged, pierced and rolled but, as they are soft when hot, they are easily marked by guides or rolls and they spread considerably during hot rolling. Excessive grain growth in these materials can be caused by over-heating, making them susceptible to tears and cracks. To refine the grain size, finish-rolling temperatures are kept as low as practical. Generally speaking, more power is required for the deformation of austenitic than for ferritic steels because of their increased strengths at elevated temperatures. Like ferritic steels, over-heating should be avoided to prevent excessive grain growth, especially since low finishing temperatures are not practical because of the rolling power required. Moreover, the sulphur content of the furnace or soaking pit used must be kept to a minimum to avoid tearing and cracking of the surfaces during rolling. Generally speaking, the same processing equipment is used for stainless steels as for the heating and rolling of carbon-steel ingots but it should be noted that stainless steels require more conditioning than carbon steels. Moreover, in the rolling of austenitic steel plates, the reduction per pass and the lateral spreading of the material are less than in carbon steels. Conversely, in the rolling of bars of ferritic grades, the billets are generally slightly less in cross section than carbon steel billets because of the greater lateral spread. Based on their geometrical form (lengths of steel with square or rectangular cross sections), semi-finished products are usually classified as slabs, blooms and billets. Although not subject to precise definitions distinctions between the three forms are made according to general appearance based on the three linear dimensions (length, breadth and thickness) and also by their intended use. The distinction between blooms and billets is based mainly on size, billets being smaller than blooms in cross-sectional area but both having a length several times their greater cross-sectional dimension. The distinction between blooms and slabs is principally one of cross-sectional dimensional proportion, blooms being generally square or nearly square and slabs being rectangular with widths appreciably greater than their thicknesses. However, there are many exceptions and there are special designations for semi-finished products intended for particular uses. For example, any material to be rolled into a plate is called a slab regardless of its dimensions. Similarly, any workpiece rolled on a billet mill is termed a billet regardless of its shape or size, with the exception of round billets (such as tube rounds). In short lengths, blooms are often called blanks or blocks and specially shaped blooms for structural sections are called blanks regardless of length. 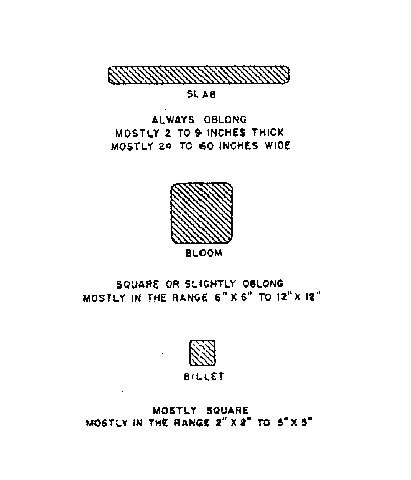 For general purposes, typical cross sections and dimensions for slabs, blooms and billets are as illustrated in Figure-2. Until recently, the three types of semi-finished products were obtained mainly by hot rolling ingots to slabs and blooms with the further hot rolling of blooms into billets. However, some blooms and slabs are produced by forging. With the advent of continuous-casting machines, the ingot stage may be bypassed and the semi-finished products cast as continuous strands. In addition, bottom-pressure casting is also employed for the direct production of slabs and billets. Prior to further processing, surface defects on semi-finished products are removed, an operation known as conditioning. 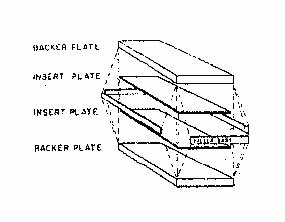 Plates are generally considered to be those flat, hot-rolled, finished products that fall within the dimensional and weight limitations indicated in Table 2. Again, there are exceptions to this classification as evidenced by slabs, sheet, bar and skelp, the dimensions of which fall within the limits. Plates may be rolled directly from ingots or from reheated slabs. The nomenclature used in describing plates is dependent on the types of mills used in their production, For example, sheared plates or sheared mill plates are rolled between horizontal work rolls and subsequently trimmed on all edges. Mill edge is the normal edge produced prior to trimming and mill edge plates possess two mill edges and two trimmed edges. Universal plates or universal mill plates (U.M. plates) are rolled with horizontal and vertical pairs of rolls and trimmed only on the ends. Floor plates are hot finished between one or more pairs of rolls in the final pass or passes of a mill. One roll of each pair is engraved with a pattern that embosses one surface of the plate in the desired manner. Although the as-rolled plate products are rectangular in shape,they are frequently cut into circular or semi-circular plates and the so-called sketch plates by shearing and/or gas cutting. A large percentage of steel plates is subjected to some form of heat treatment prior to shipment. Such treatments include annealing, Spheroidize annealing, stress relieving, normalizing, accelerated cooling, and quenching and tempering. is then rolled to the desired gage, width and length, with the two materials becoming permanently bonded because of the use of a nickel bonding agent and the high rolling pressures. The popular types of cladding steels are chromium-nickel grades of the stainless 300 series and the magnetic chromium grades in the 400 series. Other more exotic metals that are utilized are 100 percent nickel and nickel alloys such as Inconel and Monel with limited quantities of copper and titanium being occasionally used. The backing steel is carbon or a low-alloy grade which may be specified by the user. In the rolling operation, drafts are usually limited and the finishing temperatures are carefully controlled. Sometimes heat treatments are required to produce the desired corrosion resistance and physical properties, the resultant scale being removed by sand- or shot-blasting. Fig. 4. 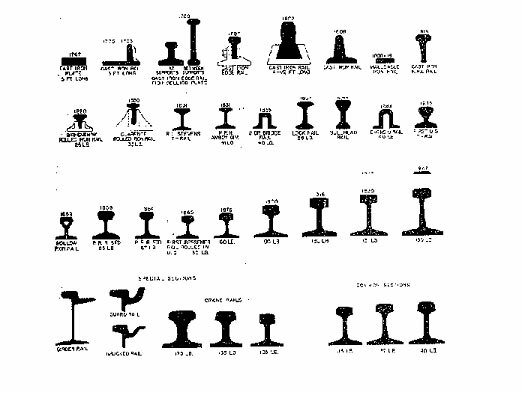 Cross-sections of various rails and the dates of their introduction. Starting with a bloom, rails are usually formed by two methods of rolling, namely tongue-and-groove, flat or slab-and-edging as well as the diagonal or angular method. Crane rails are produced in three sections of 105 lb., 135 lb., and 175 lb. per yard, usually with heavier head and web than similar rails for railroad use. Light rails are produced either from billets or by re-rolling standard rails. from end to end, an operation intended to compensate for the camber in the opposite direction normally occurring in the rails during carefully controlled cooling. Joint bars, as illustrated in Figures-5 and 6, are used for connecting rails together and are of many different designs. 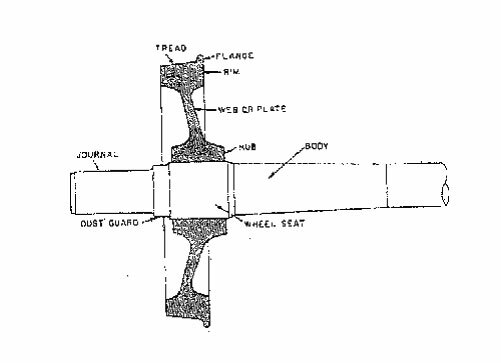 Because of the lack of symmetry in their cross section, joint bars present problems in rolling, with a tendency to form laps and seams. Moreover, difficulty is often experienced in the design of suitable guides and the bars are prone to become cobbled or caught in the table rolls of the mill. Fig. 6. 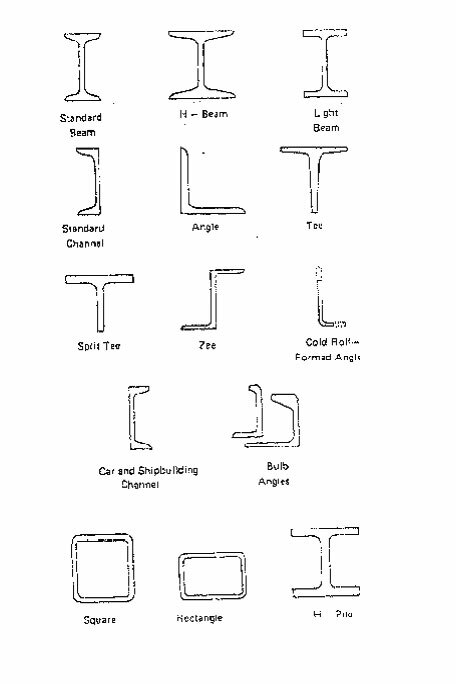 Parts of conventional joint bar. Subsequent to rolling, the joint bar is cut into convenient lengths for handling and for processing into finished units. Finishing may be accomplished in one of three ways. First, the shearing to length, straightening, punching and slotting may be performed on cold pieces resulting in cold-worked joint bars. If the sheared pieces are reheated for punching and slotting, they are referred to as hot-worked joint bars. Alternately, after hot working, they may be quenched in oil when they are designated as hot-worked and oil-quenched bars. Shapes or sections as illustrated in Figure-7 are usually divided into two classes, structurals and other sections. The former include such standard items as I-beams, channels, angles and wide-flange beams together with special sections such as zees, tees, bulb angles and center sills (used in the building of railroad cars). Other sections include H-piles, sheet piling, cross ties and those used for special purposes. A number of processing steps are common to the production of all structurals and other shapes. These include 1) heating the bloom, 2) rolling to the proper contour and dimensions, 3) cutting while hot to lengths that can be conveniently handled, 4) cooling to ambient temperature, 5) cutting to ordered length and 6) inspection and shipping. In isome instances, the products are straightened and/or heat-treated by cheating, quenching and tempering, care being taken to prevent distortion of the beam during the treatment. Shapes are furnished to standard section and length tolerances published by the American Society for Testing and Materials (Designation ASTM A6). The cross-sectional area or weight of each structural-sized shape shall not vary by more that 2.5 percent for the theoretical or specified value. Tolerances are established for variations in the cross-sectional geometry, the squareness of the ends and for the straightness of shapes (camber or sweep). A wheel consists essentially of five parts: the hub, the web (or plate), the rim, the tread and the flange, as illustrated in Figure 8. The hole in the hub into which the axle is fitted is known as the bore and the offset of the hub with respect to the rim is known as the dishing or coning. Fig. 7. Cross-sections of structurals and other shapes. Wheels are classified on the basis of the flange, the rim, the service to which they are applied, the method of manufacture, the finish and the finishing treatments. Thus one-wear and multiple-wear wheels exhibit different rim thicknesses. Industrial car, industrial locomotive, crane track, railroad freight-car and high-duty wheels are classifications based on the associated service. One method used to fabricate wheels for railroad or industrial service involves forming them from a blank by hot forging and/or rolling operations. (Wheels larger than 28 inches in diameter are almost always produced by forging and rolling.) After being hot-worked, the wheels are always controlled cooled to ambient temperature and are then machined on the tread, flange, rim and hub faces. Wrought steel wheels are either manufactured to Association of American Railroads or American Society for Testing and Materials specifications which designate four classes of steel wheels for different conditions of service. Each class is processed and treated to meet a specific service requirement and attain hardness values within specified limits on the front face of the rim. The blocks used in fabricating the wheels may be made 1) either by hot shearing or cold cutting a round bloom, 2) cutting up ingots or 3) by casting the metal for each wheel as an individual ingot. 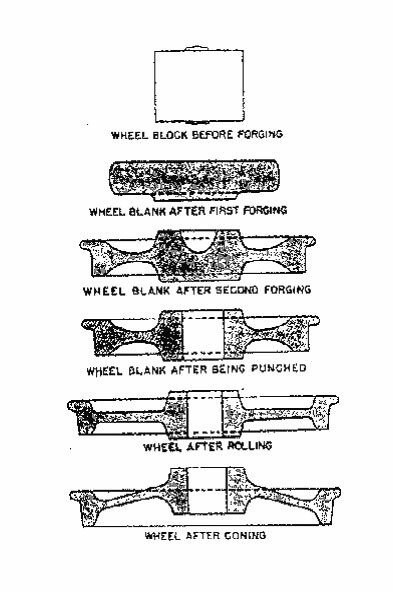 After the blocks have been press-forged, they are referred to as wheel blanks. Shaping is completed by rolling the blank in a wheel mill and processing in the sequence presented in Figure-9. The term "bars" generally refers to elongated, finished products of small cross-sectional areas, these areas embracing a wide variety of geometrical forms, such as squares, rounds, hexagons, channels and angles. They are manufactured from conditioned billets using merchant mills or bar mills employing trains of stands. Fig. 8. 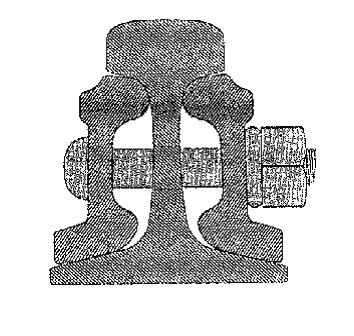 Cross-section of a wrought-steel railroad wheel on a roller-bearing raised-wheel seat axle. After the rolled bar has cooled on a hot bed, it is usually cut to smaller lengths by such means as shears, hot saws, high-speed friction saws, cold saws and oxyacetylene cutting machines. It is then frequently straightened by rotary, two-plane, or skewed-roll mechanisms. Where the Length of the bar exceeds the length of normal cooling beds, it may be coiled (for sizes up to about 1Â¼ inches in diameter) either on a pouring reel or by laying the hot coil in a stationary pan. Much of the product, particularly rounds, squares, rectangles and special shapes, are subsequently cold-drawn, a process that achieves 1) further reductions that would not otherwise be possible, 2) smoother, more uniform surfaces, 3) closer dimensional tolerances and 4) increase hardness, stiffness, tensile strengths and yield strengths with a conceitant decrease in ductility. Prior to the cold-drawing operation, bars are pickled or mechanically descaled and frequently given a therms treatment, such as carbon restoration, annealing, spheroidize annealing normalizing, quenching and tempering. Fig. 9. The production of a wrought-steel wheel by a combination of forging, rolling, and pressing operations. Wire, one of the more important products of the steel industry, is produced by the hot rolling of ingots into blooms, the blooms into billets and the billets into rods of appropriate diameter which may then be cold-drawn into wire. Rods are made into continuous coils weighing up to about 3000 Ib. in sizes ranging from 7/32-in. to 47/64 in. in diameter and are regarded as a semi-finished product. Before drawing, the scale on the rods is removed by acid pickling or other suitable method and the rods are then dipped into a vat containing hydrated lime in suspension, or other material such as borax in solution, and are then baked to dry the coating. Such lime or borax coatings not only prevent rusting of the cleaned rods, but also act as a carrier for the lubricant required in the drawing operation. The heat treatment applied to rods and wire with a carbon content of 0.40 percent and higher is known as patenting. Its purpose is to obtain a microstructure combining high tensile strength with high ductility. These qualities enable the rods to withstand heavy drafting to produce the desired finish sizes in wire that exhibits a combination of high tensile strength and good toughness. 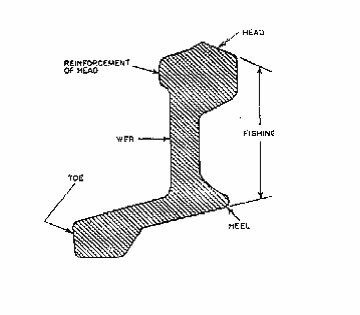 In patenting, the material is heated well above the upper critical temperature at a comparatively rapid rate to a predetermined temperature at which the transformation will yield the desired microstructure and mechanical properties. If the cooling is carried out in air, the method is known as the "OP" (old process or air) patenting. If the cooling is carried out in a lead bath at a relatively low temperature, the method is known as the "MH" (metallic hardening) process. Should the cooling be undertaken in two lead baths at different temperatures, it is described as the double-lead process. In recent years, two other patenting processes which may be carried out on the rod mill have gained wide acceptance. One is the Stelmor process in which the rod is coiled and the loops are partially overlaid on each other on a conveyor at the exit end of the mill. In the second method, known as the "ED" ("Easy-Draw") process, the rod is quickly coiled in boiling water after rolling. 1) standard pipe, further classified on the basis of wall thickness as standard weight, extra strong or double extra strong, 2) pressure pipe used for carrying fluids at normal or elevated temperatures and/or pressures but not subjected to the application of external heat, 3) pressure tubes similar to pressure pipe but suitable for exposure to external heat, 4) line pipe designed and used principally for conveying gas, oil and liquified petroleum products, water and slurries, 5) oil-country tubular goods, a collective term applied in the oil and gas industries to the three kinds of pipe used in wells, namely casing, drill pipe and tubing, 6) rigid conduit used for the production of electrical wiring systems and 7) mechanical tubing used for a variety of purposes. All of these categories may be either welded or seamless pipe with the exception of drill pipe which is made only in the seamless form. Most of these types of tubular products are usually manufactured to different minimum tensile properties and limitations with respect to their compositions as established by various regulatory agencies. Normal pipe is designated as black pipe to distinguish it from galvanized and other types of coated pipe. However, following manufacture, it is the customary practice to apply a coating to the outside surface of black pipe for protection against rust during storage and shipment. Seamless pipe is made by three processes: hot piercing, hot extrusion, and cupping and drawing. Welded pipe is fabricated from flat-rolled steel, including skelp, bars, plates, sheet and strip, by such methods as furnace, electric resistance, electric flash and fusion welding (particularly submerged-arc welding). 0.2299 to 0.1800 Over 12 to 48 incl. Up to 3Â½ incl. 0.0255 to 0.2030 incl. Over 3Â½ to 6 incl 0.0344 to 0.2030 incl. Over 6 to 12 incl. 0.0499 to 0.2299 incl. sheet and strip products . To be properly classified as sheet, the cross-sectional dimensions of the rolled workpiece must fall within the limits given in Table-4. Similarly, to be designated as finished, flat, hot-rolled carbon-steel strip, the dimensional limitations of Table-5 must be observed. Generally speaking, when hot band is to be cold rolled, its gage must bear an appropriate relationship to the final gage of the cold-reduced product. Hot-rolled strip is usually given a further reduction of about 60 to 70 percent when converted to cold-rolled sheet products and about 85 to 90 percent in the case of tinplate. However, these reductions are also dependent on such parameters as product width, composition and the cold-reduction facilities available.